A ban on the import of ash trees will come into force on Monday in an attempt to halt the spread of a deadly disease, the environment secretary has said. Owen Paterson has denied ministers were slow to react to the outbreak. The Chalara fraxinea fungus, which causes Chalara dieback, has already killed 90% of ash trees in Denmark and has been found in East Anglia. Mr Paterson said 50,000 ash trees have already been destroyed to try to prevent the spread of the disease. Until earlier this week, the disease had only been recorded in a few nursery specimens. Mr Paterson said: "We will bring in a ban on Monday. I have already prepared the legislation and we're ready to go. The evidence is clearly there." The disease was first spotted in February, at a nursery in Buckinghamshire - a case that was confirmed in March, said the environment secretary. Since then, examinations had been carried out at more than 1,000 sites and tree experts had been consulted. Mr Paterson said ash trees were not imported commercially during the summer, so the amount of time that had elapsed since the initial discovery had not increased the risk that more infected trees had been brought in. But Tim Briercliffe from the Horticultural Trades Association insisted the government's response to the disease had been too slow. He said: "As a trade we're very frustrated about it, because in 2009 we saw it out in Denmark on trees and we said you should ban imports now. They didn't do it - they suggested that it was already endemic across Europe and across the UK, and since then the disease has continued to come in, and we believe it could be more widespread than perhaps we realise at the moment." The Woodland Trust welcomed the ban but called on the government to set up an emergency summit to manage other diseases affecting trees in the UK. Its chief executive, Sue Holden, said: "Ash dieback is only one of numerous tree pests and diseases present in the UK... it is crucial that the wider issue is tackled." Ash trees suffering with C. fraxinea have been found across mainland Europe, with Denmark reporting the disease has wiped out about 90% of its ash trees. Experts say that if the disease becomes established, then it could have a similar impact on the landscape as Dutch elm disease had in the 1970s. This outbreak resulted in the death of most mature English elm by the 1980s. Elms have recovered to some extent but in some cases only through careful husbandry. The East Anglia outbreak has been confirmed by plant scientists from the Food and Environment Research Agency (Fera) at the Woodland Trust's Pound Farm woodland in Suffolk, and Norfolk Wildlife Trust's Lower Wood reserve, in Ashwellthorpe. In a statement, the Woodland Trust said that the fungal infection had been found in "mature ancient woodland and woodland creation areas on our estate". The disease has the potential to devastate the UK's ash tree population. Visible symptoms include leaf loss and crown dieback in affected trees and it can lead to tree death. In Europe, affected trees are not just in woodlands but are also being found in urban trees in parks and gardens and also nursery trees. 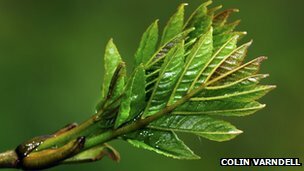 Chalara dieback of ash has been listed as a quarantine pathogen under national emergency measures and the Forestry Commission has produced guidance, including help on how people can identify possible signs of infection. Experts are urging people to report suspected cases of dieback in order to prevent the spread of the disease to the wider environment becoming established. Diseased saplings typically display dead tops and side shoots. Lesions often found at base of dead side shoots. Lesions on branch or stem can cause wilting of foliage above. Disease affects mature trees by killing off new growth.